Party leader in Rajya Sabha and national general secretary RCP Singh said he had come to know about the meeting in Delhi yesterday through newspapers. Patna: Nitish Kumar's JD(U) today said a national council meeting held by rebel party leader Sharad Yadav was "illegal" as he did not have the right to convene it in view of a recent Election Commission (EC) decision. 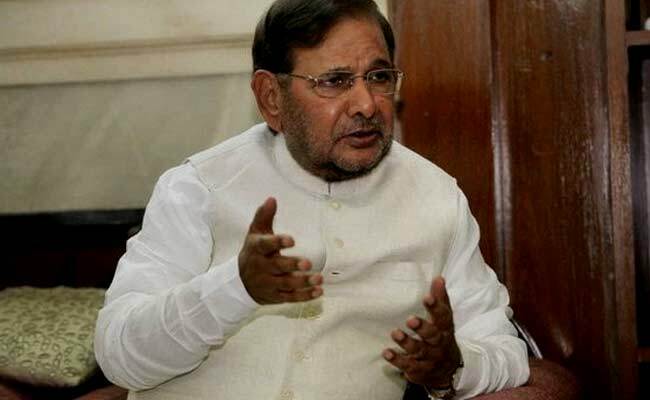 "Sharad Yadav cannot convene or hold a meeting of the party's National Council as the Election Commission has dismissed twice his plea for the allotment of party name and symbol to his faction," MR Singh told reporters here. The poll panel had recently refused to consider his plea on the grounds that it lacked supporting documents such as affidavits, he added. The party also questioned Mr Yadav's claim that 500 members of the national council had attended the meeting. "Sharad Yadav has claimed that 500 members of the national council participated in yesterday's meeting but the fact remains otherwise," Mr Singh said. The list of the members of the national council which Mr Yadav was referring to was a fake one, Mr Singh said. "The list ... expired in 2015 with the election of a new president. Besides, Yadav does not have any support in the party's legislative wing," he said. The term of the previous national council had expired in 2015 with the election of Mr Nitish Kumar as the new president at the party's Rajgir session in November 2016, he said. Stating that the EC had rejected Mr Yadav's plea for allotment of the party name and symbol to his faction twice on September 12 and September 27, 2017, the senior JD(U) leader asked how Mr Yadav could claim to have the support of 500 members of the national council, when its current strength was 194. Giving the break-up of the 194 members of the council, Singh said 103 members were from Bihar, followed by 35 from Kerala, 31 from Jharkhand, 23 from Jammu and Kashmir and 2 from Dadar and Nagar Haveli. Stating that the EC recognises the majority in the national council and legislative wing while deciding the claim of a particular person staking a claim to a party name and symbol, Mr Singh dared Mr Yadav to tell the people and the EC how many of the 194 national council members supported him.